Sankt Gallen Sesame Chocolate Stout is a 6.5% spiced stout from Sankt Gallen Brewery, based in Kanagawa, Japan. It’s part of their limited edition range for Valentine’s day – a day in Japan where women tend to give men presents – and apparently it takes 10,000 black sesame seeds to make 1 bottle of Sankt Gallen Sesame Chocolate Stout, where one batch of beer used over 200kg of the seeds. It’s hopped with Chinook hops and also HBC431 – an experimental hop from the USA that has an unknown lineage that was first released to brewers in 2016 from YCH Hops. Feel sorry for the person who had to count 10,000 sesame seeds. Sankt Gallen Sesame Chocolate Stout poured out a pitch black colour, I guess from all the sesame seeds that had been used to make it, along with a frothy tan coloured head on top, that faded to a thin layer of bubbles on top. It had a strong chocolate aroma along with some floral peachy tones coming along as well. The sesame seed aroma, if present, was probably lost on me as the only thing I could detect on them smelt kind of muted. Even when warmed up, the chocolate aromas coming through Sankt Gallen Sesame Chocolate Stout were the strongest by far. Wait – the sesame is present but in the body in much larger amounts. Sankt Gallen Sesame Chocolate Stout definitely tasted like sesame, with hints of oil and butter coming on, but the chocolate and coffee flavours dominated quickly over them. Sankt Gallen Sesame Chocolate Stout was quite dry for a stout, and also had a thick body to it – something that I really enjoy in a stout. Chinook hops can be overpowering in the bitterness area but Sankt Gallen Sesame Chocolate Stout was fairly smooth and easy drinking, so much so that the 6.5% is quite dangerous if you’re not paying attention. It finished off with a sweet flourish, along with hints of sesame butter too. 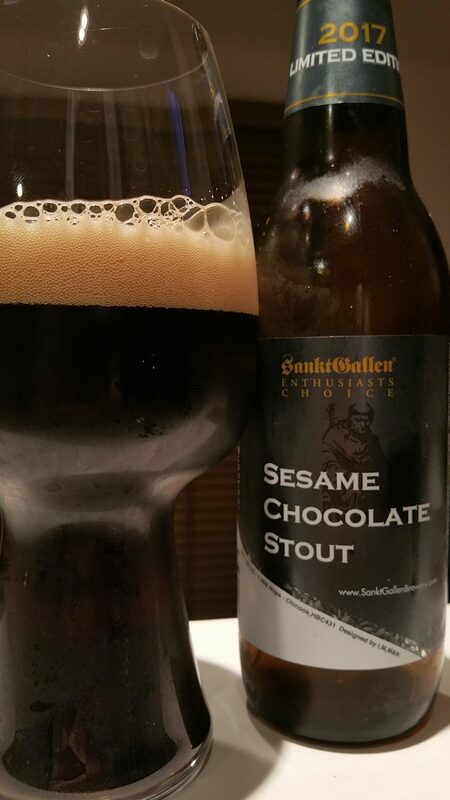 Sankt Gallen make some very good stouts and Sankt Gallen Sesame Chocolate Stout is one of them. A nice alternative.